Software testers are especially conscious of the processes they use in their work. So it’s not surprising that when they get together they experiment with meeting formats. A recent experiment is a good example of how creative folks can look at a 50-year-old meeting format, try out something fresh and innovative, and — this is so important — learn from the experience. 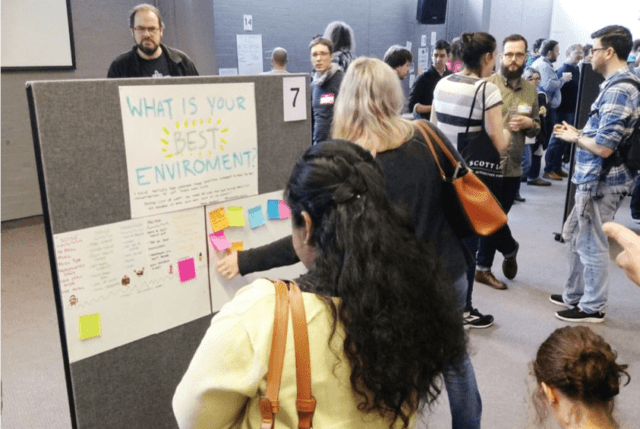 During the 3 breaks of TestBash Brighton 2018, The Ministry of Testing (MoT) trialled a new experimental conference engagement method named The UnExpo. The aim of the UnExpo was to boost the awesome community feels that are present at every TestBash and to provide a space in which software testers could converse deeply on topics of interest. Our results suggest that The UnExpo created an environment where software testers felt free to discuss their inner thoughts and feelings on the craft of software testing and their lives working in software development. We believe maximum feels were reached and attendees were highly engaged on a wide range of topics throughout The UnExpo. We intend to run a more streamlined UnExpo at future TestBashes and encourage other conferences run them too! They shy away from feedback that suggests the meeting format and processes should be changed or improved. Our hypothesis: if poster sessions can engage and encourage scientists to converse, they can do the same for software testers too. However, we felt that the scientific poster session format was too rigid, passive and formal. To maximise the engagement and fun, we encouraged the software testing community to submit to run poster stands that were interactive. Posters could be on any topic attendees were currently interested in; be it technical topics or the human aspects of working in software development. Other attendees armed with post-its, pens and awesome tester brains would then walk around The UnExpo and interact with posters of interest. Nevertheless, the vast majority of the observations were positive. The post nicely conveys, with numerous pictures and quotes from participants, what the UnExpo experience was like. The day after the event, MoT ran a Twitter poll for 24 hours. It received 58 votes, with 91% of the voters agreeing that The UnExpo worked. Did the #testbash #unexpo work? The post also documents more detailed feedback from Twitter, both positive and constructive. a description of planned format improvements. Poster presenters got to practise their communication and presentation skills. Those running stands were able to gather community feedback on their topic. Posters acted as a handy medium enabling TestBashees to easily engage with others interested in the same subjects as themselves. The UnExpo led to genuine connections and potential future collaborations being made. …At future UnExpos, we will run a more streamlined format with a higher number of stands that will run all day. We will also have a small section of stands that are exclusively for those inspired folk who want to book a slot on the day, these stands will rotate each break. We believe this strategy will allow for attendees to continue conversations but also keep the energy and topics fresh! My conclusion? This post is an excellent example of how to invent, explore, evaluate, and improve new meeting formats. To improve the quality and effectiveness of meetings, this is exactly the kind of focus and work we need! This entry was posted on Monday, April 16th, 2018 at 6:30 am	and is filed under Event design. You can follow any responses to this entry through the RSS 2.0 feed.You can leave a response, or trackback from your own site. I truly felt like I was with my peers, who face the same problems that I face, or could face in the future. I was beginning to feel that I was shouting into a vacuum and this conference proved that I’m not alone.